"Thirty years! The world has forgotten. Nobody cares. And you persist and persist! Why don't you get off my back?" 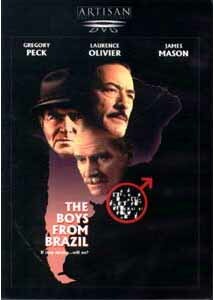 Reviewing The Boys from Brazil (1978) is a little like trying to review Citizen Kane: so many people know what "Rosebud" refers to that it's hard to retain the central mystery. Similarly, the secret behind this film (based on the best-seller by Ira "Rosemary's Baby" Levin) is pretty much an open secret as well—even the keepcase of the DVD spills the beans, so if you don't know the scoop already, don't read the back of the box! No secrets will be divulged here, however, so feel free to read on. The story concerns a mysterious plot by the infamous real Nazi doctor from Auschwitz, Josef Mengele (Peck, wonderfully cast against type) to murder 94 men of age 65 on certain dates. Olivier stars as Ezra Lieberman, a down-on-his-luck Nazi hunter based loosely on the real-life Simon Wiesenthal. Lieberman, tired and discouraged, is initially reluctant to be involved but eventually finds himself drawn into the plot orchestrated by Mengele and carried out by a band of neo-Nazis, who are in turn led by a number of unrepentant genuine Nazis. The film takes a long time in clarifying exactly what the plot is; those who already know may become slightly impatient to get to the meat of the story. The pacing is really designed for audiences not in the know. Olivier's performance is wonderful and believable throughout; I had to keep reminding myself that he was Olivier! Peck obviously is having a terrific time playing one of the most evil men in history, and he takes the opportunity for all that it's worth. James Mason has little screen time as one of the other Nazis, but he likewise comes across forcefully and successfully evokes the sentiment of the Third Reich, slightly gone to seed. The 1977 setting is slightly jarring, but oddly appropriate: somehow, seeing Josef Mengele in a white leisure suit tells us everything we need to know about both him and the late 70's. The direction by Franklin J. Schaffner is not flashy, but is certainly effective. In particular, there is one highly evocative shot in front of a mirror that acts as a terrific piece of foreshadowing, but no attention is drawn to it; it's just there to be found on repeated viewing. The camera often acts as a completely dispassionate observer, lending an air of moral ambiguity to the proceedings, which is echoed in the closing sequence. I was quite prepared to dislike this film, but on viewing it, my first desire was to see it again. The acting is first-rate throughout, and that, together with the music, truly pulls one into the movie whether you want it to or not. Image Transfer Review: The source print used seems to be nearly flawless. Only the smallest bits of occasional spotting damage is visible, and colors are faithful, if a bit subdued at times. This seems to be intentional, since there are some instances where colors are bright and fully saturated, such as a briefly glimpsed blue sky and the red of the gory climax. Some scenes are a little too dark to make out well. Blacks are solid and no pixelation is evident. The non-anamorphic picture appears a little soft except in close-ups. All in all, a decent interpretation of 20-year-old visuals. Audio Transfer Review: This disc is presented in the original mono, in the form of DD 2.0. The music is transferred faithfully and in full sound. Dialogue at times sounds muddy and hard to distinguish. When combined with the German accents being used by all of the main characters, one longs for the subtitles that Artisan unconscionably omits on this disc. The boys' voices in particular sound ADR-produced and inappropriate, as does Olivier's when he is making comments off-camera. In the portions of the film when Mengele is raving, Peck's voice becomes seriously clipped. All in all, the dialogue track is the main fault of the presentation of this film. Extras Review: Extras are quite thin. In addition to two trailers, there are bios and brief filmographies for actors Peck, Olivier, Mason, Lilli Palmer, Uta Hagen, an impossibly-young Steve Guettenberg, Denholm Eliott (who has only a tiny part) and Rosemary Harris, as well as Schaffner, Gould and producers Robert Fryer, Martin Richards and Stanley O'Toole. The menus deserve comment; while Goldsmith's Viennese waltz plays, brief scenes from the film are played, rotoscoped, against a distorted, flaming red background. This is an interesting and visually arresting technique, which gives a flavor of the film without giving anything at all away about the story. It's a shame that the keepcase designer couldn't use similar self-control. As noted above, the subtitles are a horrific omission on this film where so much dialogue is muffled or hard to understand. A surprisingly entertaining and effective thriller which has held up quite well over the years; those with weak stomachs may not be able to take the climax, which I found a little hard to take myself. If you don't know anything about the film, I recommend it highly—but don't read the keepcase! If you're already familiar with the story, then just sit back and enjoy the ride that these terrific actors will take you on.